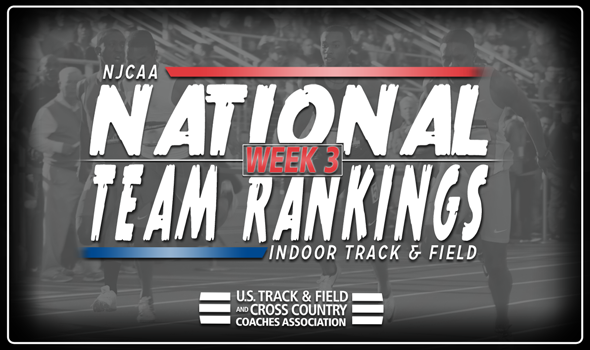 NEW ORLEANS – The men of Barton (Kan.) CC and Iowa Central CC’s women remained in the lead of the newest batch of NJCAA National Team Rankings, but a bevy of changes materialized throughout the rest of the rankings after a week of action across the nation. Besides Iowa Central CC’s men’s squad, all but one other team in the top-25 saw some sort of movement in the rankings. On the women’s side, slots two through six all shifted, as well as all but three spots in the entire top-25. The NJCAA Indoor Track & Field National Championships will be held in Lubbock, Texas, on March 2-3. Barton (Kan.) CC saw eight top-10 NJCAA Descending Order List marks hit at the Frank Sevigne Husker Invite last weekend that allowed them to remain in first in the rankings. Charlie Forbes paced the Cougars with a 60 hurdle time of 7.91, good for second in NJCAA on the season. Right behind the Cougars in the rankings was Iowa Central CC, once again. While the Tritons only notched four top-10 NJCAA Descending Order List marks at the Ted Nelson Classic, one was tops in the division. Travis Peterson’s weight throw of 18.08m (59-4) ranks first in all of NJCAA this year. South Plains (Texas) dominated the Charlie Thomas Invitational, jumping up two spots to third thanks to 10 top-10 Descending Order List marks. The Texans distance medley relay team recorded the second-best time in the nation on the year at 10:09.56 at the Charlie Thomas Invitational. Meridian (Miss.) CC returned to the top-five in fifth this week after slipping to eighth seven days ago. Freshman Javon Brown put on a show at the LSU Bayou Bengal in the triple jump, hitting the best NJCAA mark on the season at 15.29m (50-2). Rounding out the top-five was Cloud County (Kan.) CC, which slipped one spot to fourth. The Frank Sevigne Husker Invite was peppered with outstanding performances from Iowa Central CC. Two women in Agnes Mansaray (800 meters) and Adva Cohen (mile) joined the Triton’s 4×400 relay team in setting NJCAA Descending Order List top marks in their respective events at the meet. New Mexico JC saw a boost in the rankings, as the Thunderbirds moved up one spot to second after a very strong outing at the Texas Tech Open. The team posted 11 top-10 Descending Order List marks, including the NJCAA’s best distance medley relay time on the season at 11:43.74 (altitude converted). Joining the Thunderbirds in rising in the rankings was South Plains (Texas). The Texans moved up a whopping five spots to third after seeing Jelena Rowe hit the top NJCAA high jump mark of the season at 1.84m (6-0½) at the Charlie Thomas Invitational . At fourth and fifth, respectively, in the rankings are Central Arizona and Barton (Kan.) CC. Both squads fell one spot in the rankings from a week ago.